Our House has an Anchor: A Sailing Tailor? The Florida sun is intense, and Sea Gem accordingly sports a lot of canvas. The UV-protected material used on boats is called Sunbrella, and all of ours is the same color: "Pacific Blue." We have Sunbrella covers on each of our six overhead skylights/hatches to protect the glass and keep the interior cool. We have a Sunbrella cover for our liferaft, and another for our fishing chair. And one for our captain's chair. And a big one for our steering wheel. 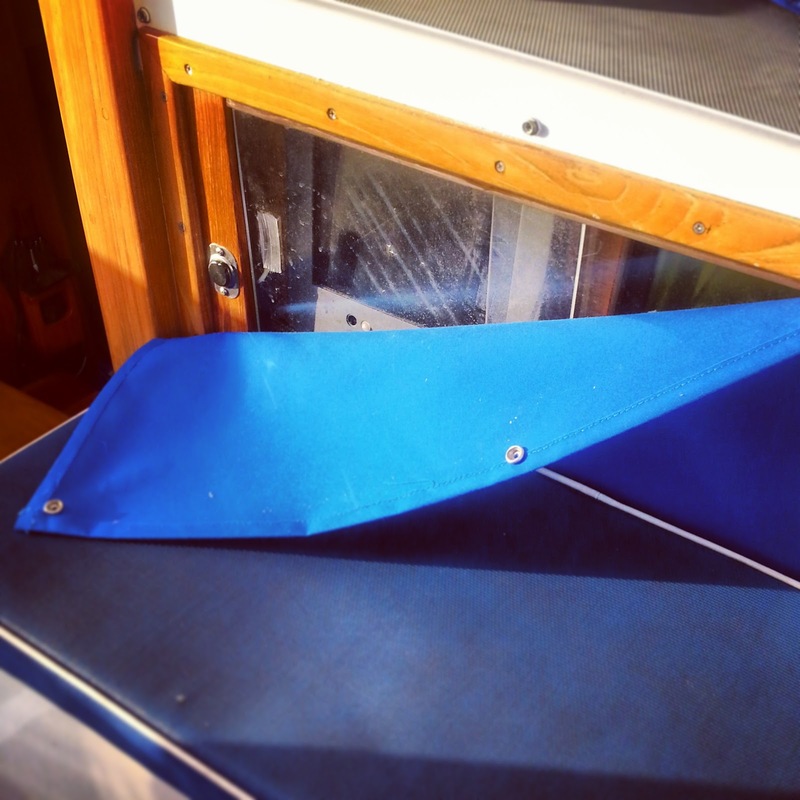 We have another large Sunbrella cover for our dinghy motor and spare anchor. We have Sunbrella covers for our storm windows. We have a boom tent for the aft cockpit made entirely of Sunbrella. All six of our winches have matching Sunbrella covers. And each of our sails has Sunbrella covering the portion that would otherwise be exposed to the sun. Altogether, Sea Gem sports a whole lot of Pacific Blue. As with everything on boats, labor is expensive, and after paying a whole lot of money for our Sunbrella boom tent, we decided that it would be nice if we could make our own Sunbrella covers. There may always be complicated tasks that will require a professional, but surely we could learn to make smaller pieces and perform routine repairs on larger ones such as patching holes and restitching areas with worn thread? And so we bought a sewing machine. They make very heavy-duty industrial models specifically for sailboats, but we opted for a simpler (and cheaper) consumer-grade model, and one of my coworkers recommended one--a Baby Lock BL9--that has a reputation for being easy to use, reliable, and capable of handling touch fabrics and threads. And so $150 or so later, we became the proud owners of a new sewing machine that neither of us had a clue how to use. Sure, we both took home ec in seventh grade where we were taught how to operate a sewing machine. We actually had the same teacher, Mrs. Mean Old Bat. But with all due respect to her talents as a teacher and whatever skills we may have acquired at the time, twenty years later, nothing stuck. Fortunately, Krissy's mother knows how to use a sewing machine, and during a recent visit, she showed us how to set it up and get started. This past week, we made our first project: a sun cover for two of our instruments in an attractive Pacific Blue. The BL9 had no trouble sewing through four layers of Sunbrella or using the industrial-grade UV-protected thread. I certainly wouldn't call the results "professional," but it does the job, and after all, we are sailors, not tailors .